Ghaziabad/Noida, Uttar Pradesh - In the village of Maharajpur in Ghaziabad, an industrial hub on the outskirts of India's capital New Delhi, Hafiz Abdul Qavi felt dejected after casting his ballot. "There was no rule of law in this country for five years," the 63-year-old shopkeeper told Al Jazeera on Thursday. "Whoever forms the government makes little difference to me." Qavi was among nearly 100 million Indians who voted in the first of the mammoth seven-phase general election - the world's biggest electoral exercise - in which the country's Hindu nationalist Prime Minister Narendra Modi is seeking a second term in office. Polling on Monday was held for 91 of the 543 parliamentary seats across 20 Indian states and federal territories, which witnessed a voter turnout of more than 60 percent, according to the Election Commission of India. Modi, 68, is the frontrunner but faces a tough challenge from Rahul Gandhi, the leader of the opposition Congress party, who has attempted to capitalise on the government's poor record on jobs and rural poverty. Gandhi, 48, is hoping to become the latest prime minister from the Nehru-Gandhi dynasty. His Congress party, which could profit from voter dissatisfaction, won three key state elections in December, chipping into the BJP's core support base in the Hindi-speaking heartland of northern India. There have been many, many people in Indian history that had the arrogance to believe that they are invincible, that they are bigger than the people of India. But they don't realise nobody is bigger than the people. Modi-ji's invincibility will be in full view in this election," Gandhi said in Uttar Pradesh's Raebareli constituency, from where his mother Sonia Gandhi filed her nomination papers on Thursday. "Don't forget 2004," Sonia Gandhi told reporters, referring to her party's victory that year despite predictions of a BJP sweep. What was on voters' minds? Khairunnisa, a 40-year-old widow also from Maharajpur, said she wants the next government to "stop the bloodshed and give us employment". In neighbouring Gautam Buddha Nagar constituency, Nikhil Mishra, 19, was happy to be a first-time voter. "I don't know about my candidate, but I am voting for development," Mishra said at a polling booth in Bishara village. 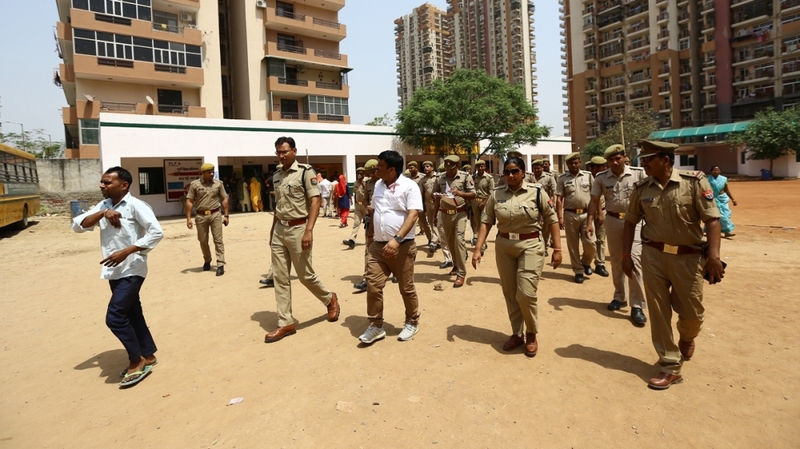 Palash Jain, another young voter, said he wanted Modi to return as prime minister "since he is the best person who can ensure security of the country". In the Indian electoral lexicon, "development" and "national security" have codified themselves as the right-wing Bharatiya Janata Party's (BJP) chief concerns, a formidable pitch that the opposition parties, led mainly by the Congress, are seeking to counter through their own promises of growth and employment in the world's seventh largest economy. Shortly after voting began, Modi on Twitter said the mood was firmly in favour of the BJP-led National Democratic Alliance (NDA), whose "aim is - development, more development and all-round development". At an election rally in the northeastern state of Assam, Modi said he saw a "massive wave" in favour of his government. "Today voting is taking place in the first phase in some parts of the country. From what we know so far, a massive wave for 'phir ek baar, Modi sarkar' (Modi government once again) is visible," he said. But places like Bishara present an alternative to Modi's development narrative. It has made headlines for a series of mob lynchings and other forms of communal unrest. It was in this village that Mohammad Akhlaq, a 53-year-old ironsmith, was lynched in 2015 over allegations that he had killed a cow and stored its meat in his refrigerator. Thursday's voting was marred by sporadic incidences of violence and malfunctioning of the Electronic Voting Machines (EVMs) in some places. A Telugu Desam Party (TDP) leader was among two people killed in the southern state of Andhra Pradesh following clashes between two parties, The Indian Express newspaper reported. Low-intensity bomb blasts were reported from Maharashtra state and the northeastern parts of India without causing any casualties, according to NDTV news channel. India's election commission said EVMs did not work at various polling booths in at least four states, including Andhra Pradesh and Bihar, ANI news agency reported. Maharashtra's chief electoral officer said voting could not take place at four polling stations in Gadchiroli district due to threats from the left-wing Naxal armed group. On Tuesday, the naxalites killed BJP legislator Bheema Mandvi and four others in their stronghold Dantewada in Chhattisgarh state's Bastar district. Despite losing their patriarch and defying the Naxal threat, Mandvi's family on Thursday came out to vote. he second phase of the polling will be held on April 18 across 97 constituencies in 13 states, including all the 39 seats in the southern state of Tamil Nadu.